This is a recipe that allows you to have a lot of fun with changing it up and determining how healthy of a salad it will be. By making the candied nuts myself, I can control the amount of sugar and fat. To start, sweetener is an option. The reduction of the wine and balsamic vinegar does have bit of sweetness to it. Instead of the brown sugar, you can use honey, molasses, agave nectar, stevia, etc and they will all give it a different flavor. I used to add a few tablespoons of olive oil to the reduction, but I found it to be unnecessary additional fat. It didn’t seem to add enough flavor to warrant the extra fat calories. The cinnamon is good for lowering cholesterol and is a great source of manganese, fiber, iron, and calcium. I have added a variety of different spices including nutmeg, pumpkin pie spice, and vanilla extract to name a few. It is fun and it changes the taste ever so slightly. If the herb salad mix is too bitter for you, choose a different one. Young baby greens is yummy and it would work even with romaine. Cheeses that work well with this salad include gorgonzola, feta, and goat. Remember to have fun when you cook and experiment. You might surprise yourself. Spread the walnuts on a baking sheet and toast for about 10 min 350 degrees. Place the beets in the oven as well. After taking out the walnuts, raise the temperature to 400 degrees and cook the beets for an additional 20 minutes or until tender. Meanwhile, reduce the wine, vinegar, sugar and cinnamon in nonstick pan for about 10 minutes at a medium heat. Reduce heat if liquid begins to boil so it simmers. Should reduce by about a third. Add the toasted walnuts and stir to coat. Continue cooking over a med heat until all liquid dissolves and creates a glaze over the nuts. Remove from heat. After the herb lettuce mix is plated, add the roasted beets, and break pieces of the cranberry goat cheese into the salad. 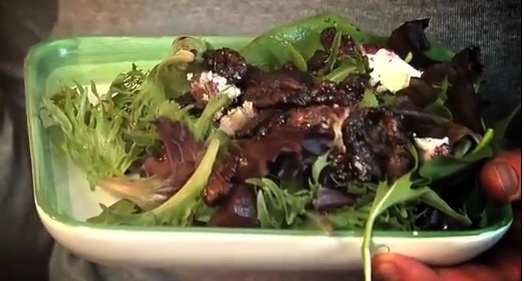 Drizzle balsamic vinegar and oil over the salad; then place the candied walnuts on top. Add fresh ground black pepper.